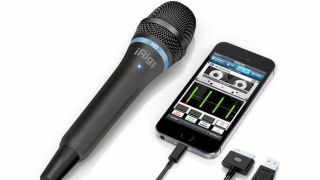 The iRIg Mic HD can plug into iOS devices and your Mac. NAMM 2014: IK Multimedia has a new handheld iOS condenser mic to shout about - specifically, the iRig Mic HD. An evolution of the original iRig Mic, this offers improved recording quality and metal body construction. Connecting to your device's 30-pin or Lightning dock, the iRig Mic HD can record at 24-bit resolution and 44.1/96kHz sample rates. It has a built-in preamp, a gain control and a multi-colour LED level indicator. Available from the second quarter of 2014, iRig Mic HD will cost $99.99/€79.99. The press release is below, and you can find out more on the IK Multimedia website. IK Multimedia, a global technology company and leader in mobile music-creation apps and accessories, today announced iRig® Mic HD, the first high-quality digital handheld microphone for iPhone, iPad, iPod touch and Mac. iRig Mic HD improves on IK's groundbreaking and highly popular iRig Mic, by offering pristine digital audio quality and multi-platform compatibility for all generations of iOS devices and Macs, in addition to its practical handheld form factor and other convenient features. Thanks to a high-quality electret condenser capsule and a precise gain control, iRig Mic HD is equipped to handle a wide range of recording applications. It's perfect for professionally capturing speech, singing, acoustic instruments, guitar amps, an entire band, or any other type of audio source. Featuring sturdy metal-body construction and a comfortable handheld form factor, iRig Mic HD is ideal for interviewers, broadcasters, presenters, singers and musicians who want the highest quality recording on the go. Its standard housing can be easily mounted on any regular mic stand clip, and its design, featuring detachable cables, keeps its overall size to the minimum for the greatest portability. iRig Mic HD supports the widest range of Apple devices via a series of three detachable cables. It's the first handheld microphone that includes a Lightning connector cable for the newest iPhone, iPad and iPod touch models, while a USB cable allows for connection to any Mac computer. A 30-pin cable for legacy iOS models is also available. iRig Mic HD comes with free apps, making it easy to start recording, processing and editing vocals or any other audio source right away. For iPhone, iPad and iPod touch, iRig Mic HD comes with VocaLive FREE* a real-time vocal-effects processing and multi-track app and iRig Recorder FREE*, a professional field recorder and audio processing app (download from the App Store. AmpliTube FREE*, a multi-effects, recording and studio app for guitarists and bass players, featuring stunning models of amps, cabinets and stompboxes, is also included. Mac users also get a free version of AmpliTube and more to download with their iRig Mic HD. *Download from the App Store. iRig Mic HD will cost $99.99/€79.99 (excluding taxes) and will be available from music and electronics retailers worldwide in early Q2.